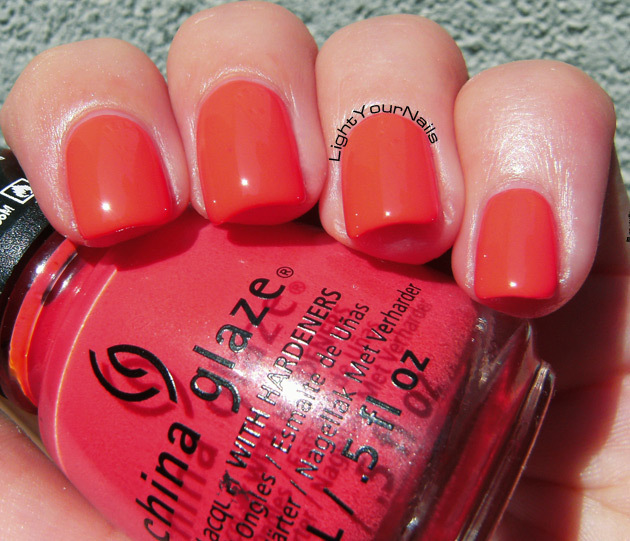 HPB Presents Neon: China Glaze High Hopes | Light Your Nails! Great China Glaze color! This one came out a few years back in one of my favorite collections. That neon collection was so much better than the newest ones in my opinion! All of the colours were true must haves, too bad a few had a poor formula. I love this color, neons are so beautiful in summer! They are! I never know what to chose in summer between a good neon or a crazy holo! È una vita che non passo da Clarissa... Vedrò di rimediare! Io adoro il corallo d'estate, pure se non mi sta sempre bene. Ma hai cambiato la forma delle unghie? Le vedo molto più stondate ai lati del solito. Questo colore merita davvero se lo trovi! Direi che "neon+estate" è tombola! Confermo che asciuga lucido, proprio bello! Corals aren't my favourite shades but I like it on you! Thank you! This year I have an addiction for corals and I keep buying more! Questo mi manca... L'ho visto da Capello Point ma mi era sembrato separato, la prossima volta controllo meglio, è troppo bellino! E' davvero bello! Ma li hanno poi riassortiti i China Glaze? Qui da me continuano a tenere sia questi che i Gelaze. That's a beautiful color! 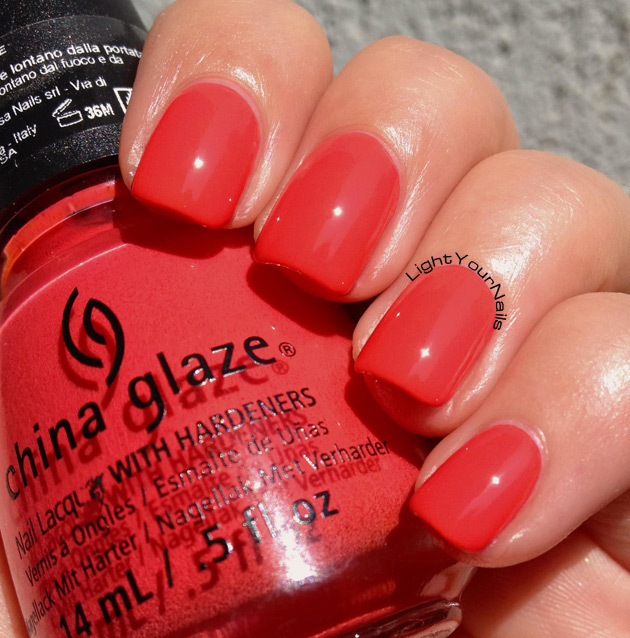 China Glaze is one one of my favorite main stream brands. that is so lovely and bright! What a lovely color! It looks great on you! One of my favorite CG's as well! Beautiful swatches! Uhhh sì, penso che ti piacerebbe tantissimo! Corals can be great any tim of year but your are right, they especially fit the summer so well! Thank you Deborah! Lately I am so season-sensitive! Definitely one of my favorite China Glaze polishes as well. Love the coral, it's like the shade for summer time. Thank you Roselynn! It's fantastic! That is a beautifully bright color! 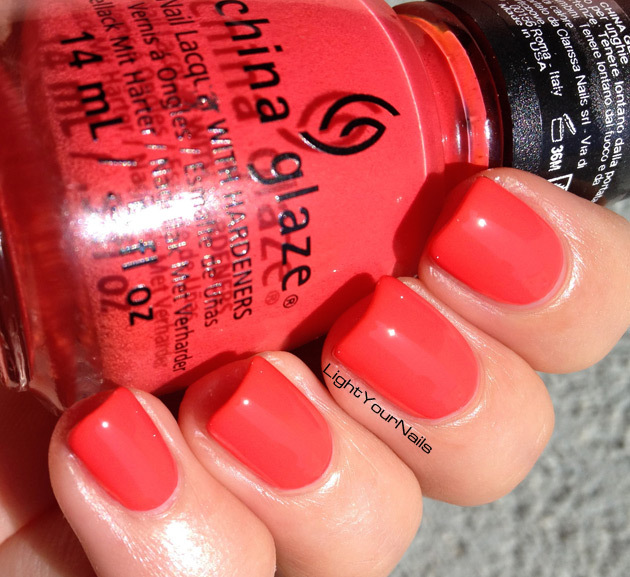 This is beautiful and one of my favorites from China Glaze as well!